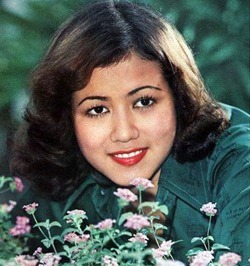 This Tanyarat Lohanan movie page contains 10 records. 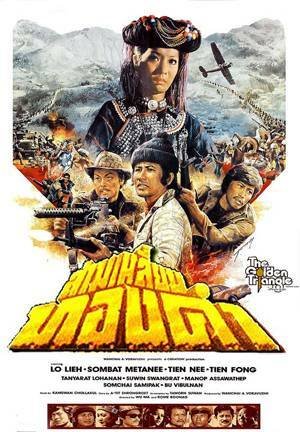 Thai movie ‎สามเหลี่ยมทองคำ was released in year 1975. 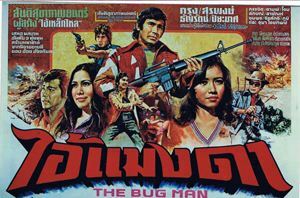 The movie is lost in Thailand but can still be found in Hong Kong through a VHS tape lasting 1h25mn. It is named 金三角 or The Golden Triangle. This movie is filmed in Hong Kong and Thailand. Manop Aussawathep is playing the head of Thai narcotics police. He receives a telegram that a drug trafficker called Peter Wong (Lo Lieh) has come from Hong kong. Pon (Tanyarat Lohanan) is playing a bar waitress. Boo Wibunnan is the barman. Peter, renamed as Tony, helps Pon harassed by drunk foreigners looking for good time. Pon introduces him to her brother, who brings him to a safer place, i.e. the Burmese border. Tony is under an arrest warrant. Meanwhile Sombat Methanee also arrives in the Golden Triangle area. Lao Su (Sawin Sawangrat) gets cheated by loaded dices. A fighting erupts and Sombat gives a hand to him. Lao Su belongs to a hill tribe gang. Sombat is fleeing Bangkok being researched by police. The leader is a woman called Hangson Wu (Tanny Tien Ni). Sombat is accepted in the hill tribe. Tony is also accepted in another gang and finds they have a secret drug making laboratory. Opium puppies were a popular production during decade 1970s. Hill tribes were later convinced to move to other cultures. A caravan led by Lao Su and Sombat with 200 horses, 8 tons of opium shall travel 20 days to deliver their goods. The other gang including Paen Pleumsachai attacks the caravan. Lao Su is killed but thanks to Sombat, ruffians are pushed back. Military spots the caravan also. Sombat meets the leader of the buyer group called Lo Han. Once they get the opium, a jeep with machine gun shots many of the hill tribe members. The police intervenes but the ruffians flee with opium and gold. Hangson Wu wishes to revenge. As opium shall be transformed into heroin, Sombat and Hangson Wu are looking for the exchange point. They fall in a trap but are saved by the police again. Hangson Wu realises that Sombat is a cop. Pon is injured. In the hospital Pon tells where the exchange point is. Tony, a Hong Kong policeman, tries to double everybody. Hangson Wu finally dies. Sombat launches his car on Lo Han's speed boat trying to flee. The drugs gangs are destroyed but the final victory is far away as opium is still produced. 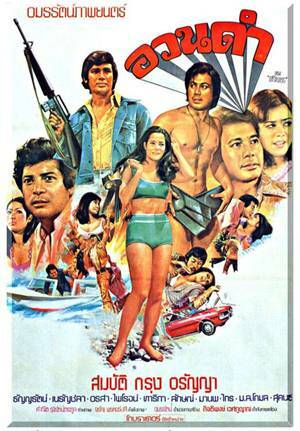 ถนนนี้ชั่ว is a thai movie released in year 1975. It is a social drama movie. Only 1h31mn is left so unfortunately not the movie full length. This movie was never released officially on VHS, DVD or VCD. Young kids face bad example (ถนนแห่งความชั่ว) shown by their parents featuring a drunkard father and absent mother. The children are the one to suffer the consequences (ผู้รับกรรม). Finally the mother quits the whole family. The grandmother (Malee Wetpraseri) then educates all the children, Oon (Tasawan Saneewong), Oi (Tanyarat Lohanan) and Inn. Oon has promised to buy a watch to Oi but the grandmother refuses as her salary of 800 baht for the whole family is already small. The neighbour (Lor Tok) likes Oi very much and keeps peeping. The three daughters finally find back their mother. The mother is now rich (Wilaiwan Watthanaphanit). Oi wishes to open a beauty saloon but needs to study first. The mother is married to a pimp called Banchup. The mother uses her own daughter to achieve her goals. She sends her daughter to a hotel room, where Ratapong (Sombat Methanee) is waiting (บังคับให้มา?). Purity is lost. As Oi wishes to wear beautiful clothes, have jewels, be rich so she accepts (ด้วยความเต็มใจ). It is her first time. She has to eat pills (ยาคุม) secretly. Ratapong wishes to meet her again (เด็กดี). Sawin, an older rich man, is also fond of her (ติดใจ). The mother and her new husband want Oi to go with Sawin again but she is reluctant. Arguments happen between Oi’s mother (แม่ดอกทอง) and Oi’s grandmother. High society (สังคมผู้ดี) takes advantage of poor people. Finally her mum convinces her to meet Sawin for his birthday. Oon is upset with her mum (ไม่เสียหายอะไร). The mother has modern conception of life and society (พ่อไม่เคยขายลูก). Oon asks to meet Ratapong as he was the first one to go with Oi. She finally starts to work in his company. Inn leaves home. Noi is pregnant with the grandfather. Wishing to rescue her sister, Oon is finally kidnapped with Oi. To avoid Banchup hurting Oon, Oi accepts to go again to Cha Am to meet Sawin. Oon finally succeeds to escape and warns Ratapong. Ratapong storms Sawin's home. Fightings happen with Banchup and his thugs. Oon shots Banchup to protect Ratapong and Sawin to revenge her sister Oi. Oon ends up in jail. Ratapong promises to Oon to marry Oi. The mother is devastated (แม่เสียใจ) and the only thing she can do is to give love (ต้องการความรัก) to her remaining children. Things she hasn’t done before. This movie is a strong critic over old rich men that can afford young poor ladies in hotels. Producer-director Sompote Sangduenchai has made movies covering the "Thai-style kaiju" and costumed Ultraman movies made in years 1970s and 1980s. He has reused footage from other Kamen Rider movies so making this movie montage a little bit strange from time to time with a succession of sequences without link. There are kitsch fx effects from 1970s decade including super computers with many big lights and weird sounds. Those movies are under Chayo productions. 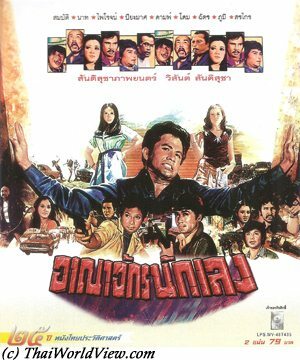 All Chayo movies (ไชโยภาพยนตร์) have Sompote's specific touch. King Dark, monsters' leader, needs to drink blood from women or children. Hopefully the Five Kamen Riders (ไอ้มดแดง or red ants) can always stop them. Those Japanese characters are adaptated to Thai customs. The five Kamen riders always succeed to be there when problems with monsters (สัตว์ประหลาด) occur. King Dark refuses to drink blood dog so he needs to find a way to get rid of the Five Kamen Riders. Three men fall in hell (ตกนรก) as they stole Buddha statue heads. A kid tries to stop them but is shot dead. He is reincarnated into Hanuman. Sinners (ทำบาป) are punished and Buddha heads are restored. Yama (พระยม), the hell god, checks his hell book (บัญชี is a map!) and they are condemned to many torments. Sompote Sangduenchai's adaptation is certainly not a film for children as many naked women and men are tortured in the representation of Buddhist hell. The monsters help one of the sinners to escape hell in order to fight the Five Kamen riders. He succeeds to capture famous Doctor Wisut. Doctor Wisut refuses to help but the monsters kidnap his girlfriend Julie to coerce him. He has no choice but to accept doing a Frankenstein creature to fight the Five Kamen riders. The new creature has the same face as Frankenstein in foreign movies. A succession of fights take place and King Dark's aliens are defeated. King Dark needs to move to Ayuthaya (เมืองใหม่). The Doctor is forced again to do a machine to make monsters to catch young ladies for their blood. Their blood is not good as they eat bad food. So they break their promise by taking Julie's blood (กินเลือดสาวบริสุทธิ์จะมีอายุนาน, มีพลัง). 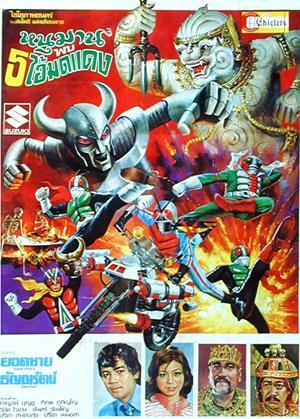 The Five Kamen Riders are finally defeated by King Dark but Hanuman helps them (ทำให้ฟื้น). They make an alliance against the monsters. They enter in their headquarters then free doctor and Julie. King Dark flees and starts a rampage in Bangkok same as Godzilla. Nobody can stop him except Hanuman. Hanuman fights in a Thai relax dancing way (สบายสบาย) and defeats King Dark. The traitor is brought back to hell (ตกนรกอีก) and his head is cut (ทำบาปก็ต้องใช้บาป). The movie is worth as it is a Thai adaption of Japanese characters by famous director Sompote adding a lot of Thainess. 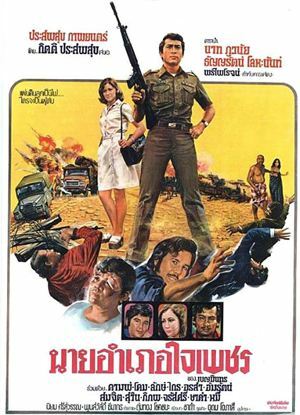 A 1976 agreement limited Sompote's copyright to only nine movies made by Sompote Sangduenchai in the 1970s.